The median price of existing single-family homes decreased to $190,000, down 0.1 percent from September 2016. 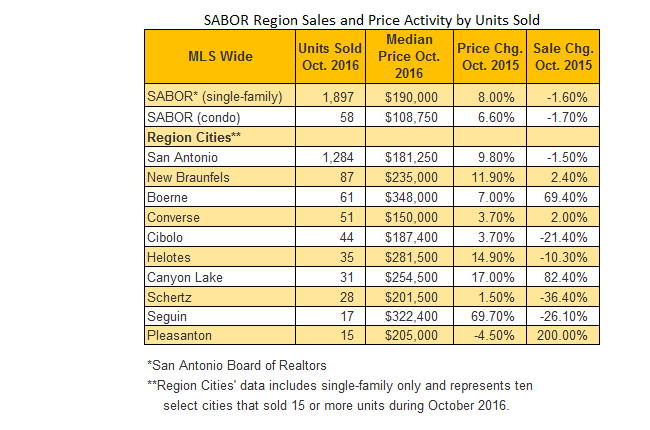 Existing single-family home sales decreased 12.9 percent from September 2016 for an October 2016 total of 1,897 sold units. Condos decreased in price to $108,750, down 9.0 percent from September 2016. Existing condo sales decreased 6.5 percent in October 2016 over September 2016 for a total of 58 sold units. ​Ride to San Antonio Market Research​ for more on Housing!